New England Culinary Institute food-and-beverage-management grad Sarah Natvig and her husband returned to Vermont from Oregon three years ago. One night they hit Randolph, hoping to eat in a hip, locally focused restaurant in the farm-filled town. They couldn’t find one, Natvig recalls. Rather than writing off Randolph, Natvig persuaded fellow NECI alum Emily Wilkins to leave a cushy chef job in San Juan and start a restaurant in the central Vermont town. 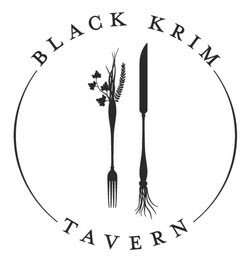 Black Krim Tavern opened on March 23 with an open kitchen, a copper-and-slate bar and a romantic, dark-walled interior illuminated by tiny lights. The restaurant’s name comes from the Russian black krim tomato, an heirloom breed known for its black, crimson and green skin. Though tomato season is a ways off, the food, says Natvig, is “very much a perfect depiction of our lifestyle.” Much of the produce comes from Natvig’s husband Chip’s Pebble Brook Farm in Brookfield. Beef and chicken are sourced from Randolph Center’s Parmelee Farm. The restaurant offers a selection of “plates to share or not to share.” So far, says Natvig, the most popular have been the beef sliders, flanked by polenta instead of a bun, and the Thai-style crêpes filled with braised chicken, crimini mushrooms and bok choy. Most other menu options will vary: “Our whole concept changes on a daily basis going with the whole seasonality and what we feel like doing,” says Natvig. Dinner begins at 5 p.m. Wednesday through Sunday. Snacks, including $3 plates of deviled eggs or roasted roots with garlic aioli, are available starting at 3 p.m. To add to the “fun lounge environment” she and Wilkins have created, Natvig hopes to add live music to the recorded tunes the restaurant already plays.